It’s the year 2154. The only people left on an over populated, ravaged Planet Earth are the poor, sick and ordinary. The healthy, rich left long ago for a luxurious, disease-free life on the space station Elysium, which is just outside Earth’s orbit. For Max (Matt Damon), an ex-con turned factory worker, living a life of privilege on Elysium has been a dream since childhood. But after he is exposed to a lethal dose of radiation that leaves him with only five days to live, getting to the space station where he can be cured by a healing pod, has never been more important. To top it all off, Max’s childhood friend Frey (Alice Braga) has a daughter in the final stages of leukemia and is desperate to get her to Elysium where she can be healed. So Max takes a risky hijacking job from Spider (Wagner Moura) who promises him passage to the station if he’s successful. Up on Elysium, Secretary Jessica Delacourt (Jodie Foster) is planning a political take-over, enlisting the help of prominent businessman John Carlyle (William Fichtner) and her man on the ground, Kruger (Sharlto Copley). Her plan hits a few bumps in the road though, when Max and Kruger’s paths violently intersect. 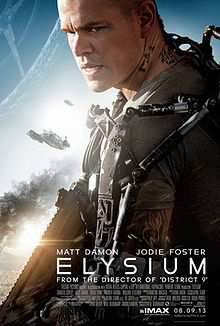 Elysium has a lot going for it – the story, action and acting (with the exception of Jodi Foster) is entertaining. It’s also well-made; many sci-fi films look cheesy, and even though it relies heavily on CGI to provide the backdrop, it looks and feels like a real place. Android and human interaction is sometimes comical, which provides a bit of lightheartedness from the otherwise grim tone of the movie. On the surface, Elysium seems like any other typical dystopian/sci-fic, action flick. There’s a futuristic, other-worldly setting, androids and advanced technology that can not only diagnose and cure any disease, but can also bring one back from death. Dig a little deeper though, and you’ll find a film that explores topics relevant to what’s going on in the news today: poverty, inequality, access to health care, the environment and overpopulation – interesting topics to think about and digest no matter what side of the political spectrum you’re on. That aspect alone makes Elysium a much more interesting film and makes it stand out from all the other science fiction movies released in recent months.